Easy and accurate UV/VIS micro-volume spectrophotometry with only one drop of sample. A wide range of concentrations is covered by automatic measurement at two precisely defined pathlengths with LockPath™ technology, which make calibration redundant. The One Click user interface is easy to learn and allows convenient operation with shortcuts. The cuvette holder adds further flexibility. Only a minimal amount of sample is required for accurate measurements. Wide concentration ranges from 6 ng/µL to 15,000 ng/µL of dsDNA can be measured without further dilutions. The Life Science Bundle – All you need is your sample! With every order of a UV5Nano Spectrophotometer you get a free RAININ LTS Pipette (L-10XLS+) and a LTS tip rack (96 tips). Profit from this bundle and work right away thanks to the UV5Nano's ready-to-use direct DNA, RNA and protein measurement routines. The One Click user interface includes many predefined applications for the analysis of bio-molecules. Nucleic acids, like dsDNA, ssDNA or RNA or can be easily tested for purity or concentration. For protein analysis, the One Click user interface provides direct determination at 280 nm, indirect determination with dyes or the commonly used assays following, for example, the Lowry, Bradford, Biuret or BCA protocols. Methods can be conveniently set up in the method editor and provide more functionality for controlling automation modules, more complex calculations and report and export functions. 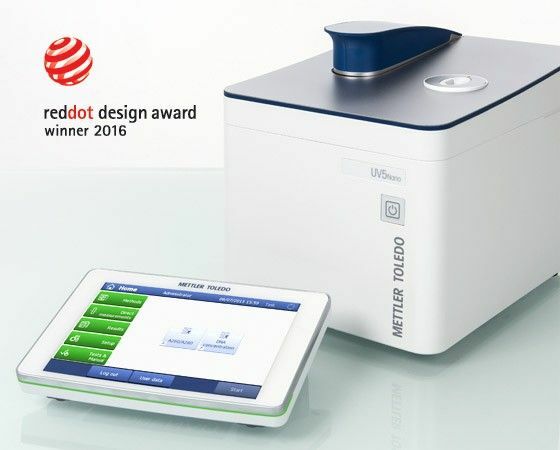 Several pre-defined METTLER TOLEDO methods are ready to use. Alternatively, the instrument can be connected to a PC. The PC does not need to be close to the instrument if bench space is limited. The network ensures that all results are securely stored in the LabX database. LabX® UV/VIS PC software expands the instrument with a sophisticated graphical editor for spectra evaluation. Data Analysis and management are simplified in one FDA 21 CFR part 11 / EU annex 11 compliant software package. To optimize and secure your workflow even better, let the task scheduler organize your measurements. A dedicated micro-volume instrument for life science reasearch. With a large library of predefined bio-applications such as, DNA and Protein analylsis. For flexibility, standard 1cm cuvette measurements can also be conducted.